Talking dolls have been around for over a century, but the fascination with making inanimate objects seem human reaches back into our early history. What is it about creating a companion that can interact with us, especially for a child, that fascinates us so? And what will that look like as our technology continues to advance? Featuring Carlene Stephens, Curator for the Smithsonian National Museum of American History and Claire Gartland of the Electronic Privacy Information Center. Enter the Musicbed Film Initiative with over $70,000 in cash, gear, and post-production to make your film idea a reality. Please take 20 seconds and complete our Listener Poll. Defacto Sound’s website was by Mast & Pocketknife, and be sure to tell your friends in the TV, Film, & Game industries all about it. Follow us on Twitter & Facebook. Our website is 20k.org. Sign up for Blue Apron and get your first 3 meals free at www.blueapron.com/20k. From Defacto Sound, you're listening to Twenty Thousand Hertz... The stories behind the world's most recognizable and interesting sounds. I'm Dallas Taylor. This is the story behind dolls that talk, and some that listen. Talking dolls have been around for over a century. But the fascination with making inanimate objects seem human reaches back into our early history. What is it about creating a companion that can interact with us, especially for a child, that fascinates us? One of the first people to create a talking doll was Thomas Edison, in the late 1800’s. He used a small version of his phonograph and worked with toymakers to make a doll that would house it. Carlene: My name is Carlene Stephens. I'm a curator in the division of Work and Industry at the National Museum of American History. We have an Edison talking doll in our collection here. It's one of only a handful that have survived. Ours for some reason has no hair, no clothes except shoes and socks. It's also a very heavy doll. I try to picture little girls or little boys carrying this thing around, and the doll is almost as big as a toddler. The doll’s voices were on wax cylinders that couldn’t be mass-produced, so reach one was recorded individually. Every doll featured one of several nursery rhymes performed by young women. Here is a restored version of Twinkle Twinkle Little Star [Twinkle Twinkle Little Star clip]. Carlene: Untrained teenage voices shouting into primitive audio machines resulted in some pretty screechy, horrifyingly screechy records. If you didn't know the nursery rhyme the words could be unintelligible. It was that bad. Regardless of the quality of their performances, these women might have been the first professional voiceover artists. Carlene: But the real purpose of the doll to be able to speak these nursery rhymes didn't succeed. Carlene: The fragile nature of the phonograph itself, the mechanism inside, the heaviness of the doll, the large size of the doll. The dolls didn't sell well either. In all, Edison’s doll was a massive commercial failure. 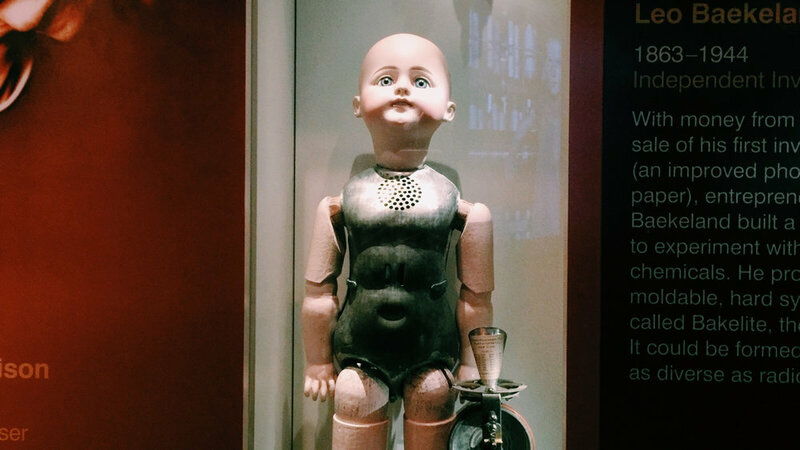 It wasn’t until 1960 that we had a true successor to Thomas Edison’s talking doll. And this one was commercially successful. Her name...Chatty Cathy. Some people were unnerved with having a talking doll in their house. The Twilight Zone even made an episode about a murderous talking doll...and get this...they hired the same actress, June Foray, who voiced the actual Chatty Cathy doll. Spoiler alert...that’s exactly what Talky Tina did. But cultural discomfort didn’t hinder toy progress. Once we had a doll that could successfully talk, there was another element to add, animation. In the 1980’s, Ken Forsee, a former Disney animatronics artist, created Teddy Ruxpin. Teddy’s slogan? The world’s first animated talking toy. While at the time this animated bear seemed like exciting new technology, it actually was in line with an incredibly old tradition of clockwork machines built to move on their own, also known as automatons. Carlene: As soon as the clock was invented, around the year 1300, it was immediately apparent that with that kind of mechanism it was possible to do other things like animate figures. Nobles employed very talented mechanicians to build little figures for banquet tables. You would wind them up and they would roll across the table [wind up SFX] and do various things. I once saw a photograph of a full sized animated bear. The exterior was bearskin, but inside there was an animated set of clockwork and that probably dated from the 17th century. In the 19080’s version, the child could insert a cassette tape into Teddy’s back and he would move his mouth along with the words that played [continue Teddy Ruxpin clip]. Along with the audio track, the tape had a second, secret track [control track SFX]. It was this control track that actually made his eyes and mouth move in time with the words, as if telling the story. But some regular tapes could be played through Teddy and even a few would make him move...especially heavy metal for some reason [heavy metal clip]. How they did that is still a mystery to me. This brings us to a different tradition. One of using technology for unintended purposes. In the 21st century, dolls can not only talk to you, but they can also listen. And some of them might be telling others what you’re saying. Find out who could be listening in on your secrets, after the break. Like most everything else, there’s a twenty first century high-tech version of the talking doll. One that isn’t just designed to keep your kid company...it also gathers information. Claire: The doll asks what the child's name is, what their mom and dad's name is, where they go to school. Where they live. My name is Claire Gartland, and I am the Director of the Consumer Privacy Project at the Electronic Privacy Information Center, EPIC. My organization filed a complaint with the Federal Trade Commission against the manufacturer of the smart toy, My Friend Cayla. With a Bluetooth connection that accesses the internet through an app on your app, this doll can not only ask your child questions, she saves the answers. Claire: These conversations, with this super personal customized information, is being recorded, and it's being sent to third parties. The biggest concern that they’ve raised, is that there now could be a database of voice recordings that’s accessible by law enforcement and national security officials. Claire: These dolls are marketed to be a child's best friend. The advertising says, "You'll be amazed at what Cayla can talk about [Cayla commerical clip]. She comes pre-programmed with all kinds of phrases and responses to really intimate, sensitive questions like whether the child is pretty or why her father wasn't able to make it to her soccer game, all kinds of really sensitive conversations that a child shouldn't be having with some company. Another major concern is security. The doll’s way too easy to pair with your device. Claire: There are no authentication requirements for a user. When she is powered on, she is discoverable in your Bluetooth connection menu as My Friend Cayla, so it's clearly a child's toy. You don't even have to have her application downloaded on your phone. Anyone can connect to her if there's not an existing Bluetooth connection available. The doll can be used essentially as a Bluetooth headset. I had that experience myself when I was connected with her and playing around with her interactive features. I received a phone call to my phone, and Cayla, the doll, started ringing. A phone can connect to the doll from 50 feet away through a brick wall. It would be really easy for the caller to essentially speak to a child through that doll. And let’s remember that the real problem here besides the fact that that’s just creepy is that parents are not told about this. Feels a little sci-fi, and then you have to remind yourself that this is actually happening right now. And if this is happening right now, what’s just down the road? Imagine a future where androids are created to be companions to our children. They can walk, talk, listen and answer. What does that future doll look like in your mind? Is it a little scary? Aside from those pesky privacy concerns, there’s something else at work here. It’s called the uncanny valley and it’s a hypothesis put forth in an 1970 essay by then Robotics Professor Masahiro Mori. The basic concept is that there’s a spectrum: One one end, robots that look and act like humans which we find appealing. And on the other end, robots that look and act nothing at all like humans which we find cute. Carlene: The study shows that there's a curve. Up here the thing looks, talks, moves a whole lot like a human and this might be C3PO, roughly speaking. And up here doesn't have any resemblance. It's R2D2. Down in here there's this area where people get freaked out. The C3PO: appealing. R2D2: appealing for completely different reasons. Down in here might be the Edison talking doll [Edison talking doll clip]. Just creepy. If you look at our automaton, creepy. It's down in here where people have that reaction. This is the uncanny valley. Getting as close as possible to human and missing and being just repulsive in so many ways. The early efforts to anthropomorphize robots, those fall into that uncanny valley. People start looking and start noticing the shortfalls rather than the excellence in almost getting there. We’re still a long way off from creating toys that fully replicate human behavior. But as quickly as technology has developed over the past century, that future might not be so distant. Just think about the difference between the Edison doll [Edison talking doll clip] and My Friend Cayla [Cayla clip]. What’s next for talking dolls? As creepy as they are, we still keep buying them, so I don’t think they’re going away. What are they going to be like in 10, 20 years? By connecting them to the internet, have we already crossed the line? That makes them smarter than us. Do we really want that? Twenty Thousand Hertz is presented by Defacto Sound. A sound design team dedicated to making television, film and games sound insanely cool. Find out more at defactosound.com. This episode was produced by Miellyn Fitzwater Barrows and me. With help from Sam Schneble. It was sound designed and mixed by Kenneth Gilbert. Thanks to Carlene Stephens from the Smithsonian National Museum of of American History, Claire Gartland from the Electronic Privacy Information Center and Teddy Ruxpin for being my bff in the ‘80s. The music you’ve hearing is from Musicbed. They represent more than 650 great artists ranging from indie rock and hip hop to classical and electronic. Head over to music.20k.org to hear our exclusive playlist. Mast created our art and Pocketknife built our website, which you can find at 20k.org. Connect with us on facebook and twitter. Our handle is 20korg on both. Consider supporting the show. You can do this by visiting donate.20k.org. Another thing that makes a massive difference is to text all your friends and tell them to immediately subscribe. If you love this show, surely you’ll have a few friends who will as well. All of these links are down in the show description.